Copper wire - 6 or 8 gauge. Available at Home Depot for less than a $1.00 per foot. 8 gauge is easier to bend, but I prefer the look of 6 gauge. - About 2 feet. Glass bottle. A wine bottle is too large - it won't hold the seal of the feeder adapter. Opt for a smaller glass water or beer bottle. Using the pliers (and a towel placed around the end of the wire to keep from scratching the copper), clamp the wire and bend a loop on one end. 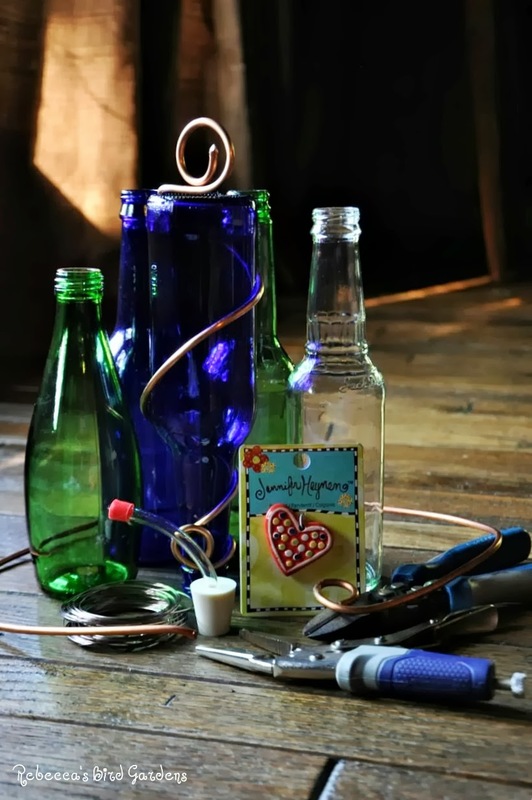 This gives you something to hold onto... Start at the neck of the bottle and twist the wire around the bottle. Add another loop in the wire at the top of the bottle for hanging. 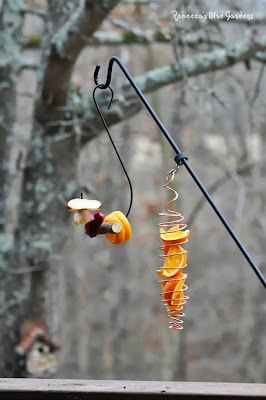 S Hook Fruit Feeder: Small stick with a hole drilled in the center. Wrap 8 gauge copper wire through the drilled hole creating an "S" shape for hanging. Once again, these are incredibly awesome. Wishing I had your talents!! Truly interesting post!! Boom & Gary of the Vermilon River, Canada. 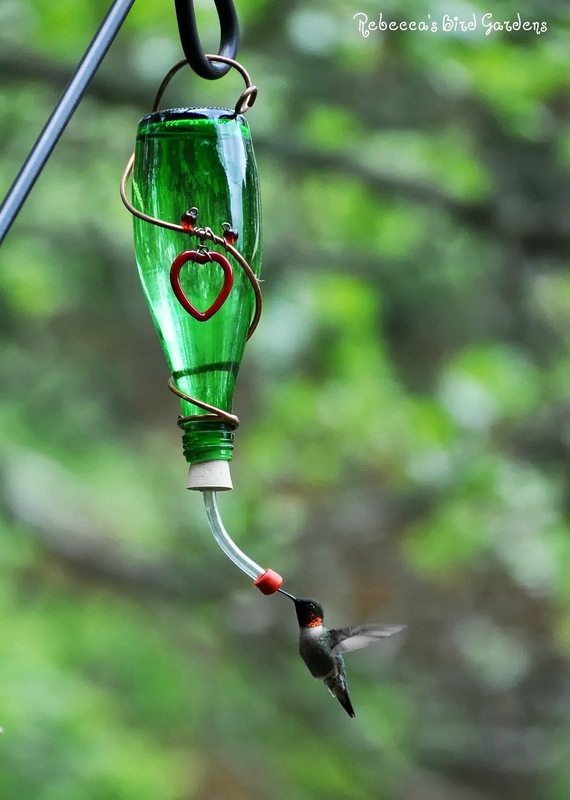 Wow, the bottle hummer feeder is beautiful. And I love the copper wire to hold the fruit. All great ideas. Thanks for sharing, Rebecca! have a happy day! If spending $15 gets you hummers, its money very well spent! 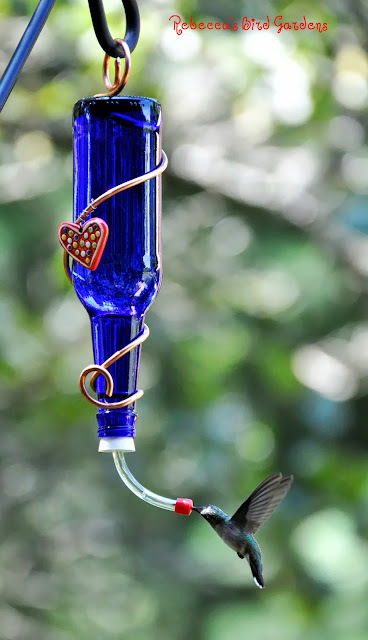 Cute feeders! I like them. 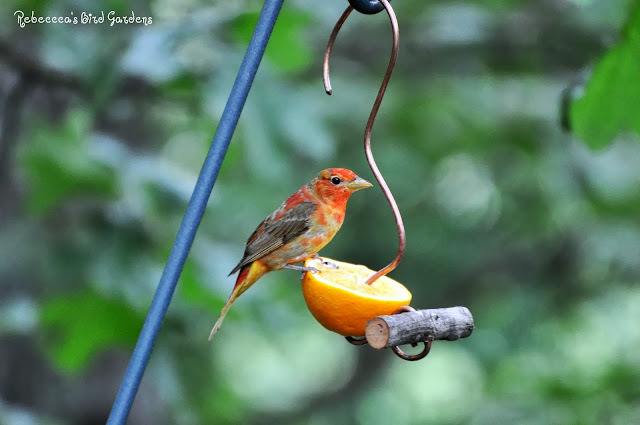 More great ideas for attracting birds! Thank you! I love this as I can repurpose so much...and I have just the spot. 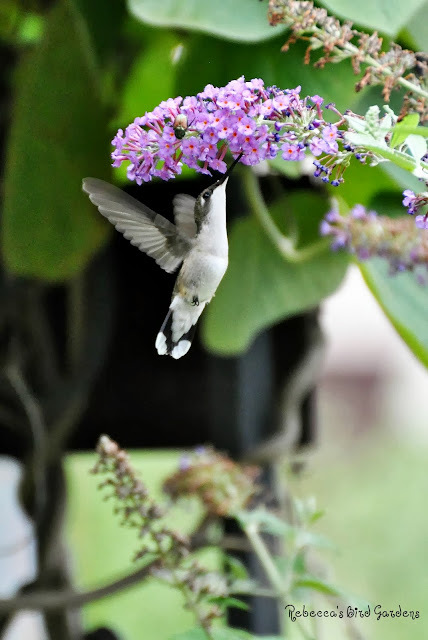 I moved a hummer feeder right off the patio and it is heaven to see them and photograph them up close. Wonderful photos! And thanks for sharing how to create these beautiful bird feeders! Oh, they're absolutely beautiful, Rebecca! Thanks for the detailed instructions, too. Do you have any trouble with yellow-jackets with that type of drip feeder. I switched mine out because the hummers and yellow-jackets were fighting over the nectar--not a pretty scene. Now I have a feeder with bee guards and the yellow-jackets are finding other nectar sources so the hummers can feed in peace. But I guess you can buy bee guards for drip feeders, too. Lovely, lovely feeders! The fruit feeders are genius! So pretty too! I would love to link to your directions if you didn't mind. Wonderful, practical, tips on building feeders for hummingbirds; I am going to try this out this weekend. I try to supplement what the hummingbirds can still get from the garden with the feeders sometime in October or November.